Growing up in the 1990's, I was a huge wrestling admirer whether it was the WWF or WCW. The peak of WCW and the start of the Attitude Era of WWF was some of the best entertainment on TV. I practiced wrestling moves at school and at home. I accidentally hurt some friends and even my sister and got hurt myself. I will always have a soft spot in my heart for wrestling. Just wanted to share that with you with this week's theme. My favorite wrestler growing up was the Rock, even though it is a cliched choice. The Rock was as great a wrestler as he was an entertainer. Just check out The Rock insulting the NWO in the video above. Who is your favorite wrestler friends? Share in the comments section. 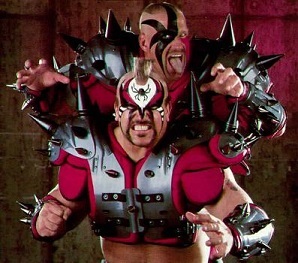 This week's blog title is The Road Warriors and you will see why. All of my spread selections are road teams. Although I try to avoid betting against home dogs, some of the lines this week seemed too tempting. Let's strike it rich! Coming off the bye week, the Packers will be rejuvenated for this divisional match up. The injuries to Clay Mathews and Charles Woodson are a concern. But a certain MVP QB named Aaron Rodgers plays for the Packers. Rodgers was getting back into last year's groove, prior to the bye. In his last 4 games, Rodgers threw 15 touchdowns to 1 interception, averaging a QB rating of 121.5. His career numbers indoors are even more impressive averaging a QB rating of over 130 in the past 3 years. With Jordy Nelson's return and the injuries to Detroit's secondary, Aaron Rodgers will have a field day throwing the ball. Will Aaron Rodgers be doing his Championship Belt celebration on Sunday?! You bet! Green Bay is only allowing 4.0 yards per rush (YPR) so Mikel Leshoure will be kept under control. So far this season, in the first 3 quarters, Mathew Stafford has thrown 3 touchdowns and 8 interceptions. In 4th quarters, Stafford has thrown 8 touchdowns to 1 interception. Stafford and the Lions offense are very inconsistent until the 4th quarter. That will not work against Aaron Rodgers and the Packers. The Packers will take an early lead in this one and won't relinquish it while the Lions play catch up. Recap: Wow! The Packers did not play very well but still managed to cover. Many critics will call this a lucky cover and they are right to an extent. However, if Mason 'Chokeman' Crosby hadn't missed 2 field goals, the Packers were likely to cover more securely. Coach Greg Schiano has brought his team closer and the Buccaneers are a united bunch. Since their bye, the Bucs have been playing with confidence and the results are showing. Doug Martin has been playing some superlative football of late. Despite the Panthers recent success stopping the run, they won't be completely shut down the talented Martin. If Josh Freeman can get the kind of protection he has been receiving all year, sacked only 13 times this season, Freeman will enjoy throwing against this Panthers D allowing 7.2 passing yards per attempt (YPA). The Panthers offense has been struggling all season long. While their running game was a point of pride in previous years, it has only been average if that, this year. Cam Newton has also been dreadful throwing 8 touchdowns and 10 interceptions while only rushing for 4 touchdowns. Newton looks dejected and it is clear that he has a lot of growing up to do. Say what you will about the Bucs secondary allowing a grand 8.1 passing YPA. The Bucs are third in the NFL with 15 interceptions, 3 of those were pick sixes. Despite the Panthers playing better since their bye, they won't be able to keep up with the energetic Buccaneers. Recap: Double WOW!! Next time I get very unlucky on #stacksheetsunday, I will reminisce about this game and feel better about my misfortunes then. With about 6 minutes left in this game, when the Panthers were leading by 11, I thought my 4 team parlay was over. All of a sudden, everything that could go right for the Bucs went right, and the Panthers revealed why they've only 2 games this season. The Bucs young players are growing up fast..
P.S. Isn't Captain Munnerlyn the best name is sports right now? The Cowboys are only 14-13 in their new stadium and are 0-3 ATS this year. I have documented my theory here on why they struggle at home. Coming off the bye week, Trent Richardson will be raring to show what he's made of, in front of this grand stage we call The Cowboys Stadium. Dallas is allowing 7.5 passing YPA (23rd in NFL). And although Brandon Weeden has struggled in his last 2 games, he is a competent QB who will have some success on Sunday. Whether you blame Jason Garrett's play calling, Tony Romo's decision making or Dez Bryant's route running, the Cowboys do a poor job of protecting the football. The Cowboys have 19 giveaways, 2nd worst in the NFC, (13 INT, 6 FUM) to 10 takeaways. The absence of Demarco Murray limits the Cowboys running game, mounting the pressure on Romo. History indicates that Romo handles pressure poorly. Lastly, from Walter Football, "Favorites are just 1-9 against the spread prior to Thursday games this year". The Browns will keep this game close so I'll take them and the points. Recap: What else is new. The Cowboys looked marginal at home and barely beat an energetic Browns team. The Browns probably would have won this game with better clock management and red zone offense. It was nice to see Tony Romo lead the offense for the comeback with less than one minute to play. I still don't trust the Cowboys at home as favorites by more than 3 points. Some people will look at the Saints schedule and suggest that this is a let down game for them. I believe that most of Saints let down games have already occurred in the first 4 weeks of the season. They are firing on all cylinders at the moment, having won 4 of their last 5 games. Jimmy Graham seems healthy which is huge for the Saints passing game. Additionally, Joe Vitt said last week that Mark Ingram is finally fully healthy. If the Saints can establish a strong running game, their offense will be even more explosive. Furthermore, the Raiders defense has been abysmal in the past 2 weeks, and things are about get uglier for them. Speaking of ugly defenses, have I mentioned the Saints'? They are last in the NFL allowing 8.6 passing YPA and 5.5 rushing YPA. However, even though the Saints D allow an enormous amount of yards, they do just enough for their offense to give them a chance to win. Without Darren McFadden in the game, Carson Palmer will be asked to do too much and he will fail under the circumstance. Recap: The Saints are looking dominant again. Drew Brees was on fire in the first half torching the Raiders secondary. It was also nice to see the Saints establish a running game in this contest. A much needed relaxing cover after the tumultuous 1 pm. games. The Saints have a very tough schedule the remaining of the season, but they seem like they could beat anyone at the moment. Look for the Brees, Graham connection to continue this week. Check out the comments section for my explanation. Recap: The Texans defense really misses Brian Cushing. They were fortunate to get this win against a hungry Titans team. Houston looked played like they were overlooking this game and almost paid the price. The Jaguars once again played well on the road where people doubt them and the spreads are huge. They may have a let down game at home against the Titans after this draining loss. I look forward to seeing your picks and feedback in the comments section. Additionally, I may post a few NBA picks in the comments section in the next few days, be in the lookout. If you enjoy my picks, please share with your pals. I would appreciate it very much. Pacers playing their 3rd game in 4 nights. They seemed lethargic in their last 2 games. They miss Danny Granger. Nobody is scoring consistently for the Pacers. The Mavericks have shown they can hold their own until Dirk returns. The Rockets match up well against the Trail Blazers. The back court duo of Lin and Harden will be difficult to handle for Portland. Houston is 2-1 on the road while Portland is 1-3 at home. As Newtons law goes "what goes up must eventually come down" and that is exactly what happened to me and my picks last week. After an awesome 3-0 start to my Podium Picks, last week was a let down going a sub par 1-2, although on the bright side my gold pick remained perfect. Now enough dwelling on the past and let's look forward to a better future and some stronger Podium Picks for this week. If we count out the last game between these two teams (which was a monumental collapse by San Diego) the Chargers have won or have lost by less than 8 points in 11 of the last 13 match ups (playoffs included). Obviously this Denver team is a lot better than it has been in years past with the presence of the great Peyton Manning, but as the Rams showed last week against the 49ers, division rival games are always competitive and not often do we see a team dominate like we expect it too. Yes the Denver Broncos are one of the hottest teams in the NFL, and Ryan Mathews does look iffy for the game, but the Chargers are fighting for their playoff lives and will be looking to exert some revenge on this Broncos team that embarrassed them in their previous meeting. I'll be honest I was pretty surprised to find the spread this small, perhaps the Bengals are that underrated, or the Chiefs really impressed in their OT loss versus Pittsburg. Coming off a blowout win versus the defending champs, the Bengals have all the momentum in this game against a Kansas City team that is still most likely demoralized after coming so close to upsetting the Steelers on MNF. Although Kansas City has one of the more underrated defenses in the NFL, the story on them is plain and simple, their offense is practically stationary, they cannot move the ball because they have no competent quarterback (How the Pats won 11 games with Cassel is a testament to the brilliance of Belichick). Look for the Chiefs defense to keep the game close for the first half, but eventually fatigue and lose track of the terrific tandem of Andy Dalton and AJ Green. As the old saying goes "If it ain't broke don't fix it" but that's not the only reason why I like the Bucs this week as my gold pick again. Plain and simple this team is on an absolute tear right now, winning 3 in a row and 4 of their last 5 games. The Bucs are in serious playoff contention and looking to lock up a wild card seat in the near future. Not the same can be said for Scam Newton and the Carolina Panthers, with their 2- 7 record this team is dismal on both sides of the ball. Although the Bucs give up the most passing yards in the NFL they make up for it by being third in the league in interceptions and also having the number one rush defense. Unless Newton somehow taps into the rookie magic he exhibited last year, I don't see the Panthers being able to keep up with the higher power dual threat attack of the Tampa offense. Give me the better team with more momentum even though they are on the road. That’s it for this week’s addition of the Podium Picks…good luck and see you all next week. I don't know if I agree with the Chargers call. Chargers were desperate last week and they lost to the Bucs. Not they're facing a better team. The Broncos D has been so dominant that if Mathews is out, the Broncos can focus on Rivers and shut him down. I agree that 8 points is a lot to give in a divisional match up, but it's against Peyton Manning. I'm staying away from this game. man, this sots guy is trying too hard. "newtons law"? maybe spend less time trying to be clever and more time studying football, cause your picks are terrible, just terrible. this omar dude seems to know what hes doing, maybe you should ask him for advice. That was harsh. Although I appreciate the compliment (thank you), what Sots does takes time and effort and he's still 4-2. Hold off on the hate until we're losing. Do you have any locks this week? Hahah i was taking this guy seriously till he said Jacksonville outright. Love the hate keep it coming! Ron, I'd probably go with Packers, Browns and Bucs. I usually like to avoid parlays even though I'll do one per week for fun. Thank you for your support Ron. I hope you know that these picks are based on a mixture of numbers, insight, analysis and gut, so hopefully they pan out. I don't want to disappoint you, so I'm hoping you're gambling responsibly. But hey, I've got money on every single game I mentioned in here, including a 4 team parlay, so if these picks have a rough week, I'll be losing my $$ with my readers. Just thought I should let you know. Norin is back!! Bringing more heat than ever before. Considering the concept of your selections, it's amazing that you have a 2-2 record on your FTG picks. Keep going strong Norin! Let me also take a second to pump OMIE's tires. What a job this kid is doing. The blog gets better each week and the guy flat out picks winners. I haven't told him yet, but I've been tailing him for the last couple weeks, I just throw a few wild picks of my own out there to get him off my trail. As far as my favourite wrestler goes, that's an absolute no brainer, WCW LEGEND, Alex Wright. Check him out below, pure class!!! Hahahah, Alex Wright #legend... It's for things like this that Norin is one of my best friends. Like most teams in the NFL, the Jaguars will be playing for pride in this game. Remember when they were 16 point dogs against the Packers at Lambeau Field? The Jags competed there and they will do the same at Reliant Stadium. The Jags actually play better on the road than they do at home. Their lone win this season came at Indy and they are incredibly 4-0 ATS on the road. Houston will not be fully focused for this game as they have a TNF game coming up the following week. From Walter Football “Favorites are 1-7 ATS prior to Thursday games this year.” Texans will jump to an early lead, then coast their way to a win. Give me the Jaguars here! 2. Play Factor: Cowboys are simply a better football team, the Browns have an awful defense and an awful offense. Key stat large spreads like this is scoring...well Cleveland is last in the league in red zone scoring percentage, 17% over the past 3 games versus Dallas' 50%. Add in the defensive scoring that Dallas never gets...I'm going ATS here....7.5 ain't enough for this blowout. Firstly, thank you for your feedback Dave! ==> Jordy is a dynamic receiver that can beat teams short and deep. Only 20% of his receptions are longer than 20 yards that because he's being asked to run both short and long routes. He's capable and he's got the QB to catch some long balls. ==> I don't doubt for a second that the Cowboys are a better team. My point is that they're not an elite team and they don't play to their potential at home. With the current trends, I don't think that the Cowboys should be 8/9 point favorites, even against the Browns. - The Saints are coming off two big victories at home and will head to Oakland to take on the Raiders who are missing both first and second string RBs to injury. This will result in Palmer throwing the ball around 50 times, and although the Saints pass defense is below average at best, I can't imagine him outdueling Brees. New Orleans wins by a large margin. - 9.5 points is a ton of points given the way the Colts have been playing. Brady could easily come out gunning as he has been known to do and have the Patriots up by 2 or 3 TDs in the first half, but that's not how I see this game going. Their lackluster performance against the Bills will spill over into this week against Andrew Luck and crew. Another close game, but the Colts will cover. - I expect Richardson to put up a big performance against the Cowboys. The Browns defense will keep Romo to a modest performance with an interception or two, and the game will come down to the running game of Dallas. I'm taking the Browns to cover the spread in a close game. Sweet picks Smith. Great record so far! Nice picks! Will the Jets figure it out and turn things around this week? That's a big question. I believe they might. Hey Omie picks are looking good bro very sweet! !I am going to take Clev+6.5 and a little on the moneyline today in NBA! !Hope it hits!Cheers bro! Big day Slim. From the sounds of it, you had a big day too. Beautiful Sunday! What a day Ron! Sometimes luck screws you, sometimes it kisses you in the mouth. How the Packers and Buccaneers pull that out, I don't know, but they did, and we won!! After speaking to Sots last night, I decided to put in a parlay with Chicago +6.5 and 'UNDER' 36.5. I also made a small prob bet that neither team will score 3 unanswered times in the game. This is not an official Horseshoe Toss but here's why I like Chicago. Chicago D creates a lot of turnovers, but they give the ball right back with carelessness on offense. But with the #1 QBs out, both teams will play conservatively. Both defenses are dominating, they will limit the others offense. I expect a similar game to the one we saw yesterday at Pittsburgh. I wanted to do the EXACT same thing except bodog put the line out at +3.5 for Chicago so i decided to stay away from that. Made a small bet on the "Under" though. I still like the Beats ATS at +3.5. I'm a little concerned about the low total of 34 though. I think a safe bet today would be to tease the Bears and the UNDER. In a teaser bet, you can buy from 6 to 11 points for a lower payout. If you do a 6 point teaser involving 2 outcomes, the payout is at -110, the equivalent of a single bet pretty much. So for example if you tease the two outcomes I proposed earlier, a $10 bet would profit $9.09 totaling $19.09. Who knew Colin Kaepernick would be so dominant? Not me. The MNF slightly tarnishes my picks, but a great weekend nonetheless. I will release a few picks for the Thanksgiving day games within Wednesday. Hope to see you guys here. Thanks Mike! It really means a lot. My picks will be posted by late tonight, early tomorrow. Wish you a Happy Thanksgiving as well. Cheers! Haha, I think the Bears D thought they could have an easy match up against the rookie. They were proven wrong. We'll get em' next time!